Various methods have been adopted for the classification of lakes and to indicate their trophic status. The most commonly and widely uded method is based on productivity, while the frequently used biomass related trophic state index is that of Carlson (1977). This index requires a minimum data and is generally easy to understand, both in the numerical,but the tradiational nutrient related trophic state categories fit into its ideal for use in volunteer programmes. Trophic state is defined as the total weight of living biological material (biomass)in water body at a specific location and time. Trophic state is understood to be the biological response to forcing factors such as nutrient additions (Nauuman,1917), but the effect of nutrient can be modified by parameters such as seasons, grazing, mixing depth etc. In accordance with the definition of trophic state , the trophic state index (TSI) of Carlson (1977) uses algal biomass as the basis for the trophic state classification . three variables, Chlorophyll a pigment , Secchi depth and Total phosphorous independently estimate algal biomass. There are no lake types. The trophic continuens is divided into units based on the base 2 logarthimic transformation of Secchi depth. Each 10 unit division of the index represents a halving or doubling of the Secchi depth. Because TP often corresponds with the transparency, a doubling of the TP often corresponds to halving of Secchi depth. Chlorophyll a pigments doubles every seven units (Carlson,1980). The range of the index is from approxametly 0 – 100 and has an advantage over the use of raw variables. It is easier to memorize units of 10 rather than the decimal fractions of raw phosphorous and chlorop[hyll values. The three index variables are integrated by linear regression modes. Any of the three variables can therefore therotically be used to classify the water body. Chlorophyll is given highest priority for classification, because this variable is the most accurate of the three at prediction algal biomass. Where TSI is Carlson Trophic State Index and In is natural logarithm. (TP and chl-a in micrograms per liter (ug/L) and SD transparency in meters). A range between 40-50 is usually associated with the mesotrophy (moderate productivity); index values grater than 50 are associated with eutrophy (highly productivity); values less than 40 are associated with oligotrophy ( low productivity). 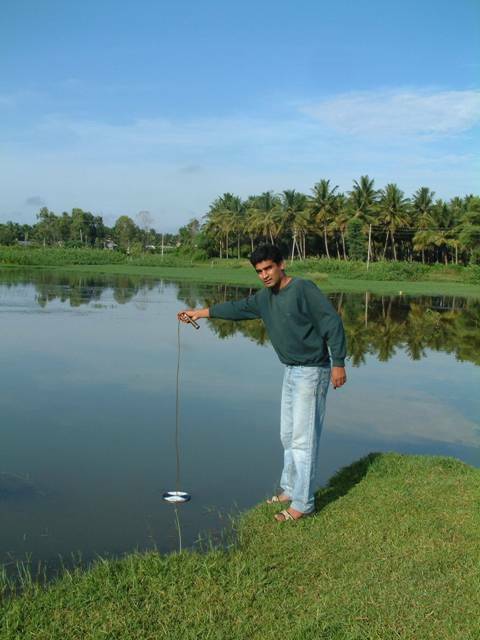 As an example 15 water bodies of Mysore cities where studied applying carlsons trophic state index. The values of the three variables, index for each parameter and average of their attributes are all presented in Table 1. these Index Values are plotted in Fig 1 to denote the relative ranking of the average Trophic State Index. Among these 5 lakes were classified as Mesotrophic, 4 lakes as eutrophic , 3 were hypereutrophic . Any Trophic State Index gains value whenit can be correlated with specific events within a water body. The list of possible changes that may occur in water body. The list of possible changes that may occur in water bodies with various TSI is presented in Table 2. some characteristics, such as hypolimnitic oxygen, or fish may vary to a slight extent and may sometimes be not rel;ated to actual TSI. Karangi lake, Devi lake, Santhe lake have TSI values between 50 – 60 and this can be attributed to eutrophy where anoxic hypolimia and macrophytic problems are quite possible. Under such circumstances conservation can be done by removal of hydrophytic macrophytes and warm water fish can be introduced. Varuna lake, Hadhinarulake and Darga lake have TSI values between 40 – 50 and this can be attributed to mesotrophy where the water is moderately clear and there is increasing probability of hypolimnetic anoxic during summer. The dour of the water changes and the water becomes turbid which may lead to loss of fish population. Under these circumstances manual clearing of these algal mass and excess hydrophytes is necessary. Kukkerahally lake,Bogadhi lake and Shetty lake have TSI between 60 – 70. under these circumstances the blue green algae dominate, algal scums specially that of Microcystis aeruginosa when the water emits a foul smell and the transparency of the water reduces. The remaining lakes, Lingambudhi,Bilikere lake have TSI values reaching above 80 , resulting hypereutrophy, TP rises considerably resulting in high limited productivity , dense growth of algae and Macrophytes. Teresion pond has a TSI value of 94. Here transperancy reduces completely, TP rises to an enormous level. A close look at the lake indicates that thick algal scums, reduced macrophytes, foul smelling water resulting in huge fish killis. The lakes that have TSI values above 70 are very difficult to manage and conservation stratergies often fail. The only possible way is draining off entire water and refill it through rain water harvest. Monitoring eutrophication is an important part of assessing and managing lake ecosystems. Phosphorous is commenly the growth limiting nutrient for algae (Horne amnd Goldman,1994). TP the combination of free floating compounds of those incorporated in biota is the most common nutrient measured in lakes. Chlorophyll a can be estimate of algal biomass and more eutrophic the lake. A Secchi disc is used as measuer of the transparency of water, which is the function of the density of varying algal populations and other suspended solids (Heiskary , 1985). Steffanson et.al. (2001) report that eutrophication, although a natural process over time, is often accelerated by human activities termed cultural eutrophication, humans influence a lake by increasing the concentration of plant nutrients, primarily phosphorous (Harper, 1992). These nutrients can enter the lake through agricultural land, sewage or waste water which can cause over enrichment. This produces direct and indirect biological changes to lakes leading to the production of algal blooms. Indirectly eutrophication may cause depletion of dissolved oxygen concentration as a result of bacterial respiration during breakdown of dead algal biomass. A major strength of TSI according to Carlson (1980) is that the interelationship between variables can be used to identify certain conditions in the lake that are related to the factors that limit algal biomass are affect the measured variables. Determination of TSI is an important aspect of lake survey and is an aspect of water quality. It can be an easy measure of trophy where in biomass is involved. 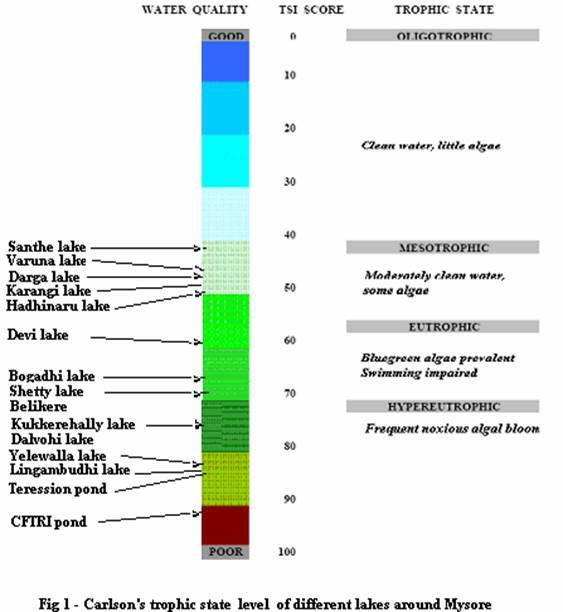 Measurement of chlorophyll can be used as a primary index for trophic state classification and to infer the functioning of the lake. The index can be used as a teaching tool as change in plant biomass affects hypolimnetic oxygen and fish species its possible effect on food chain and recreational potential. It is essential to modify the lake according to the user and not simply making the water clear. Carlson, R. E. 1977. A trophic state index for lakes. Limnology and Oceanography, 22 (2):361- 369. Naumann, E. 1929. the scope of chief problems of regional limnology. Int. Revne ges. Hydrobiol. 21:423. Horne, A. J. and C. R. Goldman. 1994. Limnology, 2 nd ed. McGraw-Hill , New York . Heiskary, S. A. 1985. Trophic Status of Minnesota Lakes . MPCA, Roseville . Steffanson,C,l.rose and Nvoelz, 2001. Trophic State Index measurements for six stearns county lakes during June – September 2001. report to stearns county environmental. pp 14. Harper, D, 1992. Eutrophication of Freshwaters. Chapman and Hall, London . TSI <30 Classic Oligotrophy; Clear water, oxygen through the year in the hypolimnion, salmonid fisheries in deep lakes. TSI 30-40 Deeper lakes still exhibit classical oligotraphy, but some shallower lakes will become anoxic in the hypolimnion during the summer. TS 40-50 Water moderately clear, but increasing probability of anoxia in hypolimnion during summer. TS 50-60 Lower boundary of classical eutrophy: Decreased transparency, anoxic hypolimnion during the summer, macrophyte problems evident, warm-water fisheries only. TSI 60-70 Dominance of blue-green algae, algal scums probable, extensive macrophyte problems. TSI 70-80 Heavy algal blooms possible throughout the summer, dense macrophyte beds, but extent limited by light penetration. Often would be classified as hypereutrophic. TSI > 80 Algal scums, summer fish kills, few macrophytes, dominance of rough fish.